How can rural communities attract and retain younger generations? 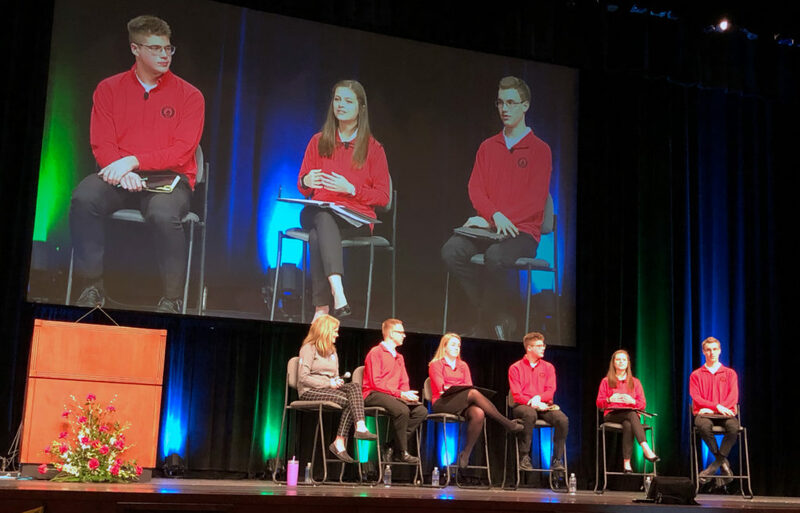 This question was posed to a panel of Youth Leadership Council (YLC) delegates at last week’s annual meeting of the National Rural Electric Cooperative Association (NRECA) in Orlando. The YLC members attended the 2018 Electric Cooperative Youth Tour trip to Washington, D.C., and were nominated by their Youth Tour peers to serve on the YLC. The panel discussion, “Engaging the Next Generation of Leaders at Your Co-op,” was held during two back-to-back sessions on March 12. For the panelists, it turns out a little engagement — including through electric cooperative-sponsored youth programs — can go a long way. Finley (on screen, center) pointed to internships and engagement with a co-op’s board of directors as ways to nurture a sense of community in young people. Internships at electric co-ops, programs like Youth Tour and co-op scholarship programs are all ways to engage young people and foster a sense of community, according to the panelists, which can help draw them back home after college. North Carolina’s electric cooperatives offer a range of community programs, including academic scholarship opportunities, Touchstone Energy Sports Camp Scholarships, Bright Ideas Education Grants and the NC Youth Tour. Finely found the Youth Tour to be inspiring and energizing.